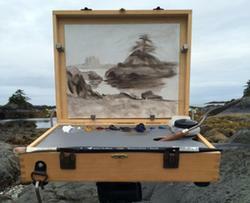 As I described in my original post on the subject (which will be updated shortly), pochade boxes are small, usually wooden boxes, meant to serve as a portable artist’s palette and easel for painting on location. Many also contain storage for supplies. Most are equipped to be mounted to camera tripods, but some are simply meant to be held in one’s lap or set on a table when painting. 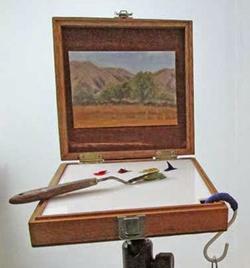 Pochade boxes have become the defacto standard for plein air painting, largely supplanting the larger French easels and being more common than the field easels and plein air systems meant to handle larger canvases. 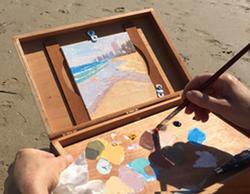 Most commercial pochade boxes represent an investment, often a barrier for painters unsure if they want to commit to plein air painting on a regular basis, or for those on a budget. As of this writing, the least expensive commercial pochade box of which I’m aware is the Guerrilla Painter Pocket Box — a small handheld “thumb box” for 5×7 panels that retails for between $70.00 and $85.00 USD. It has no provision for mounting to a tripod (though holes are drilled for adding a proprietary mounting bracket for an additional $24.00). Most other commercial pochade boxes range in price from $125.00 to $400.00 and up. So Do It Yourself instructions have gained momentum in recent years. 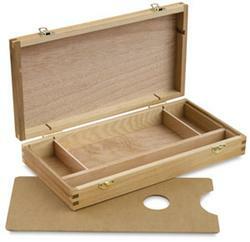 By far, the most common type of these are cigar box to pochade box conversions. Most cigar stores continually go through cigar boxes as they sell individual cigars, many of them are wood and some are quite nicely finished and well suited in size and shape for making a pochade box. You can usually pick them up either for free or for three or four dollars. Most are made of lightweight wood. When you go looking, you may want to bring a tape measure or typical painting panel to be sure the box you choose will fit your chosen panel size (usually set into the lid). If you don’t have access to a cigar store, new cigar boxes and similar wooden boxes can be purchased on Amazon (and here), or from craft sources like Michaels or Joann Fabrics for $7.00 or $8.00, though some of these may be too shallow to allow much storage under a palette. You can also check eBay and/or your parent’s attic for any kind of wooden box that seems suitable. 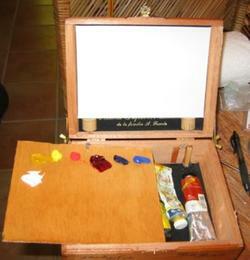 You could also do a similar conversion from an artist’s sketch box (and here), which would be a more expensive start, but would include a correctly sized palette, stronger hinges and latches, and often a handle. 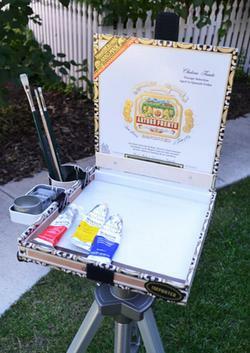 Most cigar boxes have weak, inexpensive hinges, not likely to hold up under the stress of holding a panel while painting, so they usually need to be replaced or supplemented. 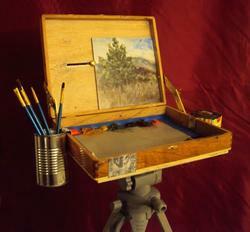 Also, some accommodation must be made for holding the lid open at a usable angle when using it as an easel. Most DIY versions will also add a stronger latch and often a handle of some kind. Usually, dowels or small wood blocks are cut to length and glued in the corners of the base to provide a palette support, with space underneath for supplies. Wooden, acrylic or glass palettes must usually be cut to size. Existing wooden palettes can be cut down. Palettes can also be made from masonite painting panels coated in gesso and sanded smooth. The more complete versions will include a “T-nut“, a threaded mounting that allows for putting the box on a photographic tripod, like most commercial pochade boxes. The appropriate size to match tripod mounts appears to be 1/4-20 (1/4″ diameter, 20 threads per inch). 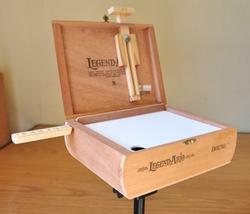 Usually, additional wood must be added in the area of the T-Nut to provide a more solid mounting than the typical cigar box’s thin, light wood. The boxes without provision for tripod mounting are meant to be used in your lap or on a table. Some have a thumb hole cut into the bottom of one of the compartments, making a “thumb box” that allows the box to be held in one hand like a traditional artist’s palette. I’ve tried to provide an overview here of some cigar box to pochade box conversions. This is by no means comprehensive, it’s just meant to be a representative sampling with an emphasis on those that I feel convey enough DIY information to be useful. In the listings below, I’ve linked the author’s name to their post or video describing the project. Most of these instructions are casually presented rather than laid out in comprehensive detail, so you may have to hunt a bit for the relevant details, but we should be appreciative of the time taken by these artists to share their experience and ideas. I will follow up this post with another devoted to more elaborate DIY pochade box instructions not based on cigar boxes, most of which are larger and can accommodate larger panels, with more adjustment and room for storage, and sharing more features in common with commercial pochade boxes. 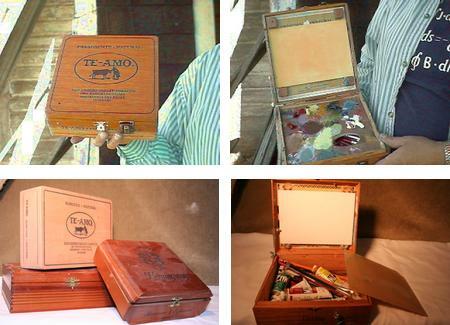 This was the first mention of building a cigar box pochade box I encountered on the web, and at the time the only one I knew of, so I think of it as the original online instruction for building one, and it is still one of the best. Unfortunately, the original website no longer exists, so I have linked to a version on the Internet Archive. Two strips of lath support the palette, which is cut with a thumb hole so it can be held separately. Brass mending strips and a small bolt hold the lid up and four blocks glued into the lid make a holder for a 5×7 panel. This is a pretty basic cigar box conversion, with some dowels supporting the palette and a couple of braces for holding open the lid. Another straightforward conversion, with wood or plastic blocks for palette supports and wing nuts for the lid. Plastic surface savers and one of the hinge bolts hold the panel in place. There are better photos of her box on Empty Easel. 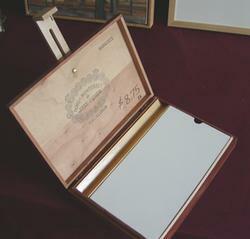 This cigar box came with a divided tray which sets in the box upside-down to become the palette. A block on the back supports the lid and framing clips hold the panel in place. A clever use of canvas stretcher keys to support the palette and an unusual slide hinge highlight this conversion. A small L-shaped fastener holds the panel in the lid. 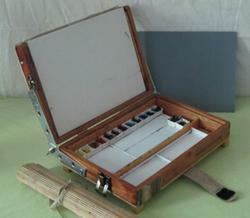 A nicely done cigar box pochade for both watercolor and oil. Metal brackets and a wing nut hold the lid. L-shaped fasteners hold the panel. A leather strap holds the box closed and keeps the panel from sliding out in transit. 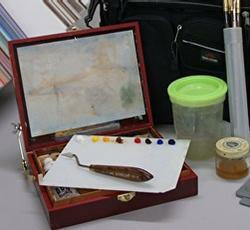 Plastic watercolor trays have been cut down to fit into the compartment and the oil palette rests above them. 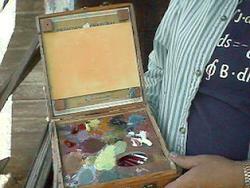 This conversion is a “thumb box”, meant to be held in one hand like a traditional palette while painting. The bottom is compartmentalized and one compartment has the thumb hole, placed so the box can be balanced in the hand. Everything but the palette surface and panel are removed when painting to keep it as light as possible. A wooden ledge and simple office clips hold the panel in place. A box with a larger than usual mixing area, but too shallow to provide much storage. Techniques are applicable to other size boxes. A cut-to-size piece of masonite in the bottom provides the extra depth and strength necessary to use the T-nut. A unique clip and plastic tubing arrangement holds open the lid. Paint stirrers are used to brace the painting panels, which are simply held on with binder clips. Closure is velcro. A two-part post. Not exactly a cigar box, but the principles are the same. A wood block holds the lid up. Four corks cut to size hold the acrylic palette in place, with room underneath for supplies. Metal “mending strips” and a wing nut hold the lid in position. Another bolt and wing nut in a slot in the lid hold the panel in place. A commercial tripod mounting plate from Guerilla Painter is used instead of a T-nut. This looks like an unusually sturdy cigar box, but the instructions are pretty detailed. Dowels are hot-glued in the corners to support the palette, which is made from a masonite painting panel, painted and cut with a thumb hole to use separately. 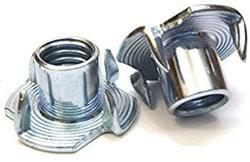 L-shaped brackets can hold panels in the lid, which is held open with metal braces and a wing nut. An extra piece of wood has been glued to the bottom to support the tripod mount; four rubber feet raise the box above that for use on a table. A clever extender for the panel holder, made from lattice, is a highlight of this functional box. Another piece of lattice provides the extra thickness and strength in the bottom of the box necessary for the T-nut tripod mount. A piece of v-shaped molding serves as a trough to keep the fresh paint separate from the mixing area. A wood strip on the back supports the open lid. This is probably the best tutorial and most sophisticated design I’ve seen for a DIY cigar box pochade box. The wooden block on the back of the box that holds open the lid in use is set in a slot with a wing nut, allowing the angle of the lid to be adjusted. A square of plywood in the bottom of the box provides the extra depth and strength needed for the T-nut mounting. Strips of narrow wood support the palette, and another is adapted to be a removable brush holder that plugs into the outside of the box with lengths of clothes-hanger wire. The panel holder looks sophisticated, but seems easy enough to construct, and features a wooden adjustment knob on the back of the lid. The panel holder and knob extend a bit from the box when closed, but still make a compact design. This YouTube video (w/skipable ad) shows an interesting conversion with double slide-out trays. A little short on the how-to instructions, but food for thought. This YouTube video (no ads) features an unusual configuration with two cigar boxes stacked together. Two mending strips and a thumbscrew hold open the lid. Cork in the lid allows pushpins to hold watercolor paper. A third, shallow cigarbox tucks inside the top of the first and acts as a removable tray that can be attached to the outside of the box with additional thumbscrews and L-brackets. 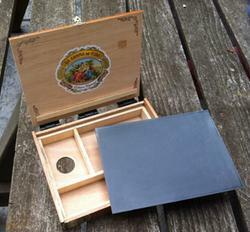 The bottom cigar box is a storage area, and a slide out piece below that holds a brush washer when in use. The tripod mount has not been added at this point. I will follow this post with another about more elaborate DIY pochade boxes, as well as updating my original post on commercial pochade boxes. 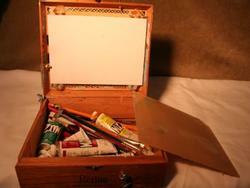 But when looking for ideas for a cigar box conversion, don’t limit yourself to those presented here. Look at the more elaborate homemade boxes as well as the commercial ones to see how they’ve solved the basic problems of storage, palette arrangement, easel adjustment and panel or paper holding for inspiration. You will also find variations aimed more at watercolor or pastels. If you come up with some clever ideas, consider sharing them with others the way these artists have. Here is a link to my solution of a homemade box. What a helpful roundup of artist-made pochade boxes. So many ingenious solutions. Looking forward to your upcoming post about DIY tutorials. 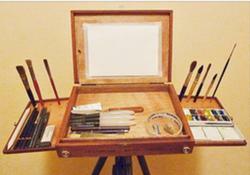 And thanks for covering my sketch easel video in your recent post. Thanks, James. Your videos set the standard for instructional web videos and continue to get better. I have yet to see anyone mention the wood boxes that come with all manner of cheap art supplies from stores like Hobby Lobby and Michaels. They appear to have been designed to mimic pochade boxes, but cost anywhere from $20 to $100. They come in several sizes and some even have have pull-out drawers. Of course, most will need some modification. But, at least you’re starting with a lightweight wood box with hinges, closures and a handle. And, you can give the cheap paints or pastels to your kids.